Local leaders identified a place to relocate San Jose’s Hope Village, an un-permitted outpost created by activists as a clean, safe alternative to the homeless camps dotting the South Bay’s riverbanks and roadsides. On Tuesday, the city of San Jose offered up land if Santa Clara County agreed to oversee the campsite for the next six months. 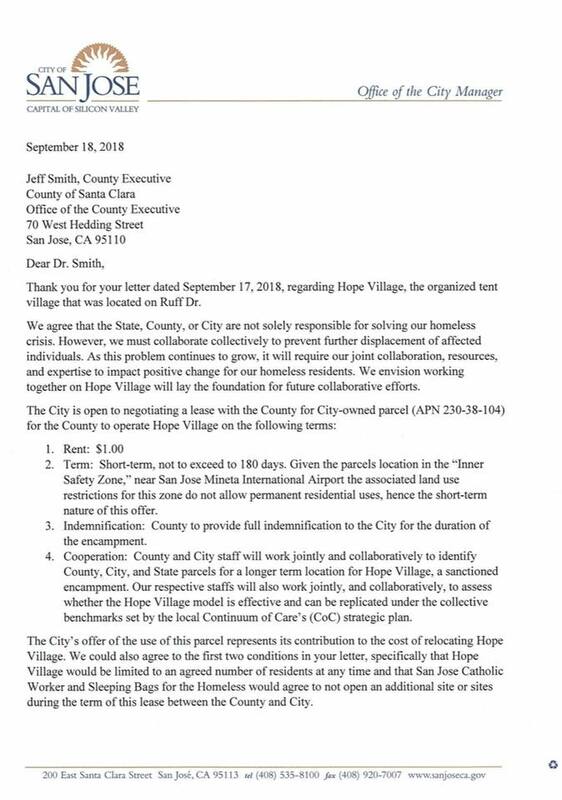 While the county prepares the city-owned parcel on Regent Street for campers to stay, privately-funded Hope Village will remain beside the SEIU union hall on Ruff Drive under the flight path of the Mineta San Jose International Airport. Its six residents say they’re grateful to have a place to stay with sanitation and running water, but it’s a downgrade from the state-owned parking lot up the street where the California Highway Patrol evicted them on Monday morning. Organizers of Hope Village—comprising members of Casa de Clara Catholic Worker and Sleeping Bags for the Homeless and a neighborhood group called San Jose Residents—established the campsite without government approval out of frustration with the filth and incessant sweeps endured by the 4,000-plus homeless people living outside in the South Bay. County voters passed a $950 million bond measure in 2016 for permanent housing, and the city is considering another one this fall to generate $450 million for new homes, but there’s a lack of short-term shelter in the meantime. In a letter dated Tuesday, County Executive Jeff Smith and San Jose City Manager Dave Sykes agreed that the city would lease the land to the county for $1 for 180 days and that the county would have to provide full indemnification. The land lies under the airport’s flight path and remains undeveloped because of land-use restrictions. County supervisors Dave Cortese and Cindy Chavez have also directed the county to identify potential permanent sites, as has Councilman Don Rocha. Cortese said he’s heartened by the city’s responsiveness to Hope Village. “The urgency and importance of the houselessness crisis in Santa Clara County demands that all government institutions respond quickly and collaboratively, and I am encouraged by the city’s immediate willingness to work with the county on Hope Village to obtain a fair and humane resolution before the residents are forced to relocate again,” he said in a statement to reporters Tuesday. Meanwhile, the parking lot owned by the California Employment Development Department (EDD) where Hope Village sprang up unannounced on Sept. 8 lies empty, underscoring the absurdity of the situation to the camp’s residents and organizers. Jacquie Heffner, a co-founder of San Jose Residents and Hope Village, posted a photo of the empty lot on Facebook with a question for the agency that demanded the eviction. The Mountain View research center, which employs more than 1,000 staffers and another 1,000 contractors, is hard hit by the budget crisis. > County supervisors Dave Cortese and Cindy Chavez have also directed the county to identify potential permanent sites, as has Councilman Don Rocha. Just fence the encampment, put the law enforcement watching them, give them jobs washing recycles and you have a prison. They live in tents to do they can do whatever they want. If you put laws enforcement and is required to work they will leave Santa Clara County. They have only six plus twelve living there already. Maybe the organizers can take them home with them. Why not? The organizers need to spend the night there to get more media attention now and stay with their hobos 24/7. I pray you never become homeless. So….where did our $950 million bond money to fund low income housing disappear to? Now they want $450 million more?!!! Voters are basically stupid so no problem. Ms. Heffner wonders aloud why the illegal encampment was forced to move from government land? Really? Golly, I guess she hasn’t grasped the concept that insurance and liability costs figure into the equation. Yep, once one person finds a reason to litigate,for whatever reason, all others will soon follow. Hope Village is a much better idea than Villas on the Park. Homeless have to “live” somewhere, and this is a powerful solution. However, we will still have mentally ill homeless and druggies in our neighborhoods until we demand a Guardianship law. There’s plenty of reporters that should be willing to take home a bum, based on the stories here and over at Murky Gnus. Just one tent per backyard could be their slogan. The taxpayer subsidized parking garage Liccardo gifted to the Murky Gnus could shelter soooo many during this “housing crisis”… right? Add to the list all the helpful bleeding heart politicians, they have big houses that I’m sure are hobo friendly. Plus the County Building has a bunch of flat, open grass over by where the flags fly… that area could hold dozens of tents. The County Supervisors could give up their personal parking spots for RV parking and bike to work… a win-win! Do these reporters and politicians REALLY want to help? Guess not. Driving down Highway 280 the other day. The Stanford Campus offers LOTS AND LOTS of buildable space for “tiny homes” and Tuff Shed hobo huts. Plus, building all the academic buildings closer together — I’m thinking cheek by jowl — would be so much more practical and convenient for the trust fund children and their professors. It’s really nice that they are paying more than lip service to the subject of homelessness. I think they really have a good thing going on here & I hope they can overcome their current problems after they temporarily resettle. Obviously these activists need to get the homeless a permanent location they can call home.